Since I could not actually swear to having bought pearl beads in Des Moines, I went on an Ebay mission to look for replacements. Trawling Ebay is always fatal as I tend to get a little carried away with browsing for things that I did not know I needed. I managed to find some reasonably priced cultured pearls AND some other beads, obviously. Unfortunately, I found myself buying a vintage charm bracelet. It arrived safely and was absolutely lovely but when I put it on I realised that it was not really my style. I decided to put it back on Ebay rater than leave it unworn in a drawer so hopefully I won’t make too much of a loss! Instead, I bought a couple of new beads for the Chamilia bracelet that I bought in Houston and I intend to wear that one more often. 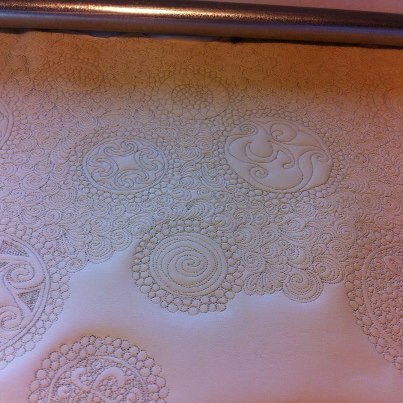 I decided to work on the white goatskin and silver spandex project this week so I experimented with pressing hard with a ballpoint pen through the Celtic circle patterns that I had drawn to emboss what I wanted to stitch. It was really hard to see so I sketched some more details in using a frixion pen. For some reason, the ruler base kept getting stuck on the plasticky spandex side so I had to quilt everything totally freehand, even the circle outlines. Despite being a fairly substantial leather, it quilted beautifully but I think I prefer the silver side which is actually the back of the project. I made a trip to “Treasures”, an amazingly jam-packed tiny gem shop in Kincardine O’Neil and bought some strands of amythest, rose quartz and turquoise chips to hand sew onto my leather projects. I left them a very old glass bead necklace that had been broken for years to see if they could fix it up for me. I asked for their expert opinion checking that the gems I wanted to use would have been available to Vikings or Celts and they confirmed that the stones I had picked were either Scottish or could be found in countries where the Norse people traded. I managed to spend a little while painting white pearlescent paint inside all of the circles and then I hand-sewed a ring of tiny gem chips around one of the circles. 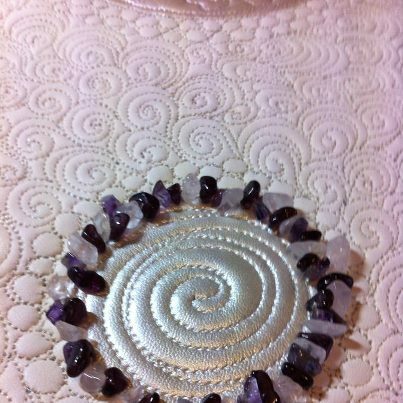 It took me quite a long time as I don’t do much hand sewing at all but I got neater and faster and I think the embellished circle looks terrific. I bent my ridiculously thin beading needle by poking it in and out of the quilted leather but it was relatively easy and I did not even have to use a thimble. I can’t help thinking how long the chamois corracle will take to bead though! The revised entry forms arrived for Festival of Quilts and make me wonder HOW I intend to send them my large 3D items. They have to be with the exhibitors a few weeks beforehand and the in-person drop off depots are in the south of England. I wonder if a corracle would fit into a washing machine box? I was utterly obsessed or more likely, possessed by the desire to complete the corracle quilting and to complete the totally absorbing trilogy of books set on the Isle of Lewis by Peter May. The dense quilting was pretty hard going but most gratifying as the texture on the chamois and spandex is gorgeous and I am not sure which side I actually prefer. The spandex was more than a little challenging as it stretched in all directions. It was rather like adjusting a pair of Spanx hold-you-in-knickers as I tried to get rid of the wrinkles while it was on the quilt frame. Every time I stopped for a cup of coffee or lunch, I greedily read a few chapters as the characters and Hebridean scenery seemed so real. I tried to tell myself to savour the experience but the stories were too compelling. I could even imagine myself living on a windswept croft, eating porridge and cutting peat. For several nights I read well past midnight until the whole story was complete and I sincerely hope that the author will add to the series. I may get a little more work done this week but I am about to embark on a third Carcassonne novel by Kate Mosse that is likely to distract me. 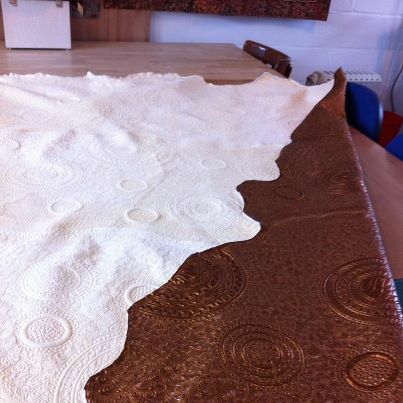 Once I took the 9 quilted chamois skins off the frame I realised how weighty this piece is. Listening to a play on Radio 4, I used gold fabric paint to highlight the quarter-inch concentric circles. I took a small off-cut of chamois and hand sewed some beads onto it using nymo thread and a fine leather needle. 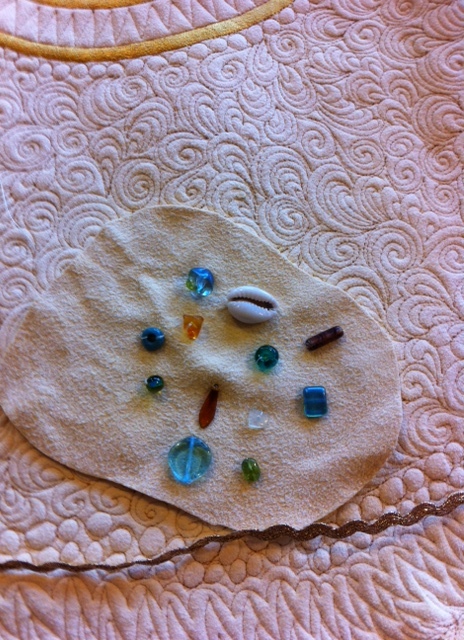 I was delighted at how easy it was to attach small chips of amber and some shells. 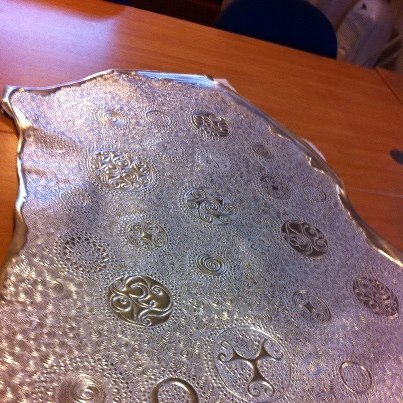 I want to embellish the outside of the corracle using the type of trinkets that Vikings may have traded. I can’t really sew the beads on until I have the the quilted fitted onto corracle frame as there will be quite a lot of shaping and cutting to do. I decided to quilt right out to the edges as I intend to use leftover pieces to cover the paddle handle and possibly make some notebooks if there is enough. We had two seasons this week: there was heavy snow and treacherous driving conditions on Wednesday but a rapid thaw the next day which led to beautiful spring-like weather for the next few days. It spurred me on to do a mini spring clean in the Music room and my workshop. I bought a few plastic crates to organise my teaching materials and get rid of some projects that had been hiding in shoe boxes. I found the raw garnet chips that I thought I had lost but I have not remembered where I stashed some pearls that I bought in Des Moines. What Next? = A Corracle! I was reminded how much it is possible to achieve when I only have to teach in school for one day out of a week. 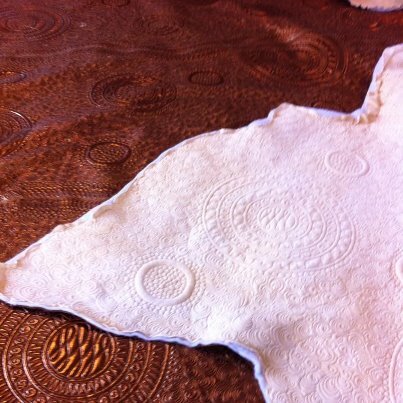 A customer quilt was dispatched, a piece of musical fabric was soon quilted so it can be turned into a gift and I joined together 9 sheepskin chamois leathers for my newest project – a quilted corracle. I was trying to remember where I first had this idea but it has eluded me. 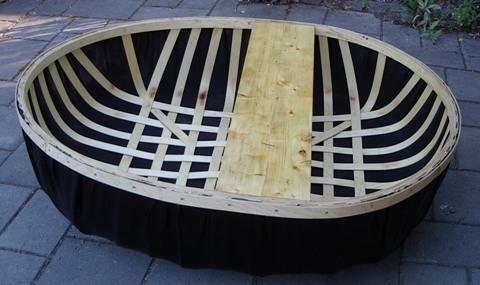 Perhaps I thought it would be fun to attempt a Viking longship after my Norse wholecloth series but then sense prevailed and I realised how big it would have to be. A one-man corracle is round, like a yurt, is slightly easier to fit in the Landy if I want to take it to an exhibition, and it could even be hung on a wall. The original versions were probably covered in leather or tarred canvas. They are dangerous little ancient vessels used by Welsh fishermen but what fascinated me the most when I did some research is that the remains of a “currach” was found near the River Spey, not so far from here. Mine will serve no practical purpose but in my mind I can see some sort of ceremonial little boat, possibly used to convey a modest sort of Viking or Celt to the afterlife. I hope to sew amber beads, shells and other trinkets that these ancient folk may have traded onto the chamois by hand but I am not sure how successful this will be. I have spent hours happily quilting away on two very different fabrics, chamois and bronze spandex which look and smell gorgeous. The spandex is extremely stretchy and is starting to look like a kind of exotic leather. The only thing that did not go well was the waterweed motif that is creeping down two of the major seams. 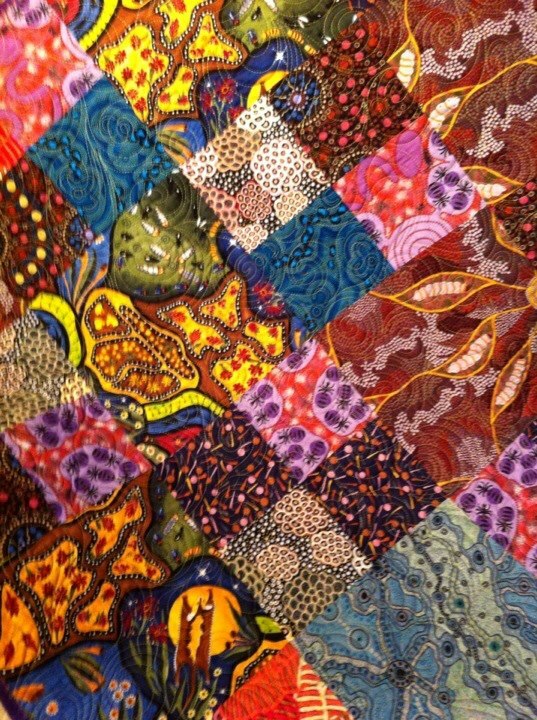 I had not really quilted anything for ages so my quilting-fluidity had definitely gone rusty. It looks like I could not decide whether I was designing a spiky plant or some misshapen feathers which is probably true but I have decided that applying gold rickrack is likely to rescue the situation. It is actually quite hard work working so intensely on such a large piece. After a while my arms and back ache and my eyes sting because I am working on a big project but on a very small scale. Because I am enjoying it so much, I can stand there for hours at a time. However, I am beginning to look forward to upgrading my machine to the newer, smoother version with a jumbo bobbin. I became an Aunt for the second time so I interrupted my corracle and ran up a basic baby quilt using some super Aboriginal prints that were left over from Oz Bewitched. I don’t suppose my new nephew will wonder why the quilt features ants and grubs instead of tractors or dinosaurs. Because I loved working with the fabric so much, it was all finished and bound within a few hours! I think I have finished piecing BzB as it is now approximately 94” one way and almost 104” the other way. I had hoped to finish it off by adding plain borders but it is already more than large enough. I was aiming for something 90-100” so there is a limit to what can still be attached. It is probably too big for most shows and I seriously wonder if it is actually suitable. Like Dr. Frankenstein, I may have spent several weeks creating a monster with its own agenda. It is a long way off what I had originally intended but it has been an interesting process. I have learned to enjoy freestyle curved piecing and appreciate that some forward planning may have been useful. On the other hand, if I rename the quilt, “Highland Fling”, I could say that ceilidh dances and the Scottish landscape have been my influences all along as there is a combination of the constraints of traditional blocks and the wild abandon of how it all went together. Most of the colours are harmoniously heathery but once those began to run short I simply used what I had managed to dye; not to mention the anarchic use of fine silk and heavy, rough linen. I still have not decided whether to continue with my original plan of quilting a very traditional wholecloth design onto this very unsymmetrical quilt with no obvious centre. 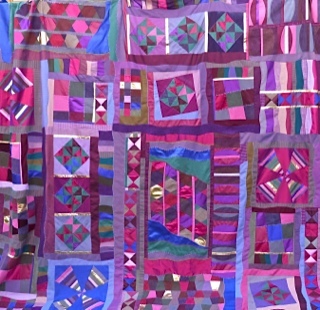 I had always intended to make the background of the “wholecloth” far more interesting than the main design but I am constantly arguing with myself on whether this quilt may need require far more contemporary quilting to pull it all together. If that doesn’t work, I expect that some fabric paint and sparkly crystals will help. I think perhaps I should put it aside for a few weeks while I practise my neglected quilting skills on the chamois skins that I bought for the corracle project. Firstly, I think I should just crack on with a perfectly normal customer bed quilt and possibly even run some straight lines up and down some music-themed fabric that I want to use for notebooks and bags. I had three intense days at school trying to capture the children’s interest in Victorians by focussing on dirt, disease and death. It is a pity that I don’t own a time machine to transport one or two of them back to 1850 to experience what life was like for children in a workhouse or factory…! 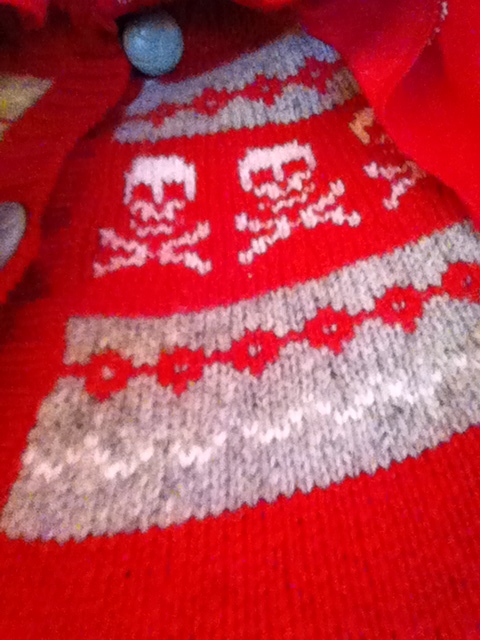 Despite having ongoing problems with my internet connection, I managed to order a new bathroom suite online and a red fairisle cardigan with a skull and crossbones pattern around the yoke instead of the more usual Shetland design. Luckily, the wifi went down again before I was tempted to place an order for a solar-powered Rayburn stove.